Rediff.com » Movies » Sumo wrestler to teach Bigg Boss housemates origami! Sumo wrestler to teach Bigg Boss housemates origami! 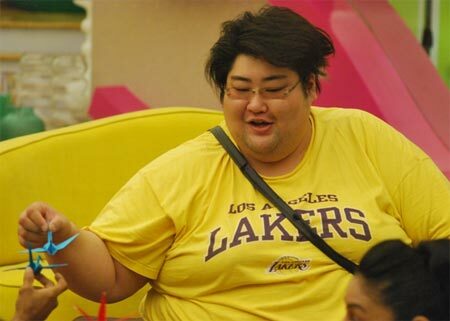 Sumo Wrestler Yamamotoyama tells Rajul Hegde -- with the help of a translator -- his plans for Bigg Boss 5. Former Japanese sumo wrestler Yamamotoyama has entered the reality show Bigg Boss as a guest. The episode will air today. The 27-year-old doesn't speak English and shared his thoughts with the help of a translator. 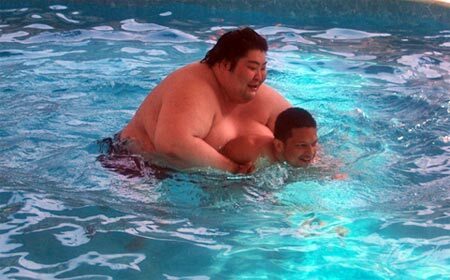 He made his professional debut in 2007, but early this year, he was asked to retire by the Japan Sumo Association after he was accused of being involved in match fixing. Yama, of course, denies the charge. He admits he was "a little hesitant" when he was offered the opportunity to appear on Bigg Boss, mainly because of the language barrier, "but I was keen to learn about Indian culture, so I thought the show will be a good platform," he says. So, how will he communicate with the housemates? "I will have placards with pictures to communicate with them. I am excited and looking forward to it." The 601pound (272 kg) wrestler will add zing to the final week. Some changes will be made in the house to accommodate his six-feet, four-inches frame. Will he do all the household chores in the house? "I am a guest so I am hoping that I will not have to do anything because even at home I don't do anything. I love to sleep and eat on a free day," he says grinning. He plans to do the same inside the house too, "but if I'm given a task, I will do it. I plan to teach the housemates a popular Japanese craft -- origami -- and some sumo wrestling too. They will just have to follow my instructions." He has heard about Indian actors Salman Khan and Sanjay Dutt who are the hosts of the show, but has never seen them because he hasn't seen any Hindi movies. And has he watched Bigg Boss before coming to India? "Yes. I have seen some parts of the fourth season and I know what the show is all about. But I did not understand what they spoke. I've observed the tasks that are given to the contestants and how they execute them. It seemed fun." He's not familiar with the names of his housemates, but he is familiar with actor Dhanush's popular song, Kolaveri Di, because there's a Japanese version of it. "I have heard it and it's amazing. The deep voice of the singer is loved by the Japanese people." Yama can dance; we got a glimpse of his Dabbang steps. His favourite Indian food is butter chicken and tandoori chicken. When Pooja Missra woke up with a love bite in Bigg Boss!